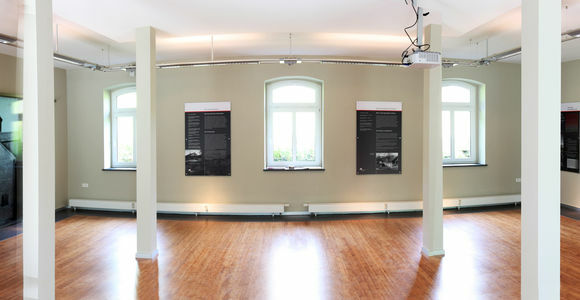 The exhibition in the visitor centres is designed to set the events in Schmiedebach into relation with the larger context of the armament industry. Another aspect of the exhibition is the history of slate mining in the Oertelsbruch Quarry. A true-to-scale model of the camp shows the situation in Winter 1943/44. Visitors can watch an introductory film about the history of the subcamp. War plant "Vorwerk Mitte Lehesten"